The Congo War was the deadliest but most underreported conflict since WWII, killing more than 5 million people. 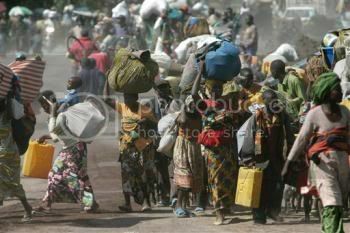 The current situation in Eastern Congo is edging towards yet another humanitarian catastrophe. According to the UN, around 1 million people are now fleeing the violence. There is news of refugee camps being emptied, burned, and looted. Cities are no longer safe-havens and people are retreating to the forest again, to hide. Political tensions between Congo and Rwanda are growing. There are signs that both camps are scrambling their allies to prepare for war. Obviously, no matter how hard we and many others try to help Central Africa's rural populations combat poverty, all these efforts will have been in vain if war breaks out again. Likewise, all conservation efforts - be they related to forest or wildlife protection - will have been futile, as war ravages entire ecosystems (the first Congo wars have led to an ecological disaster of unprecedented proportions in Congo). So please help in keeping this crisis on the top of the agenda of the international media and of those who can make a difference. Write to any of the following people in power and urge them to intervene, either on the front of diplomacy or militarily, if you think that's wise. France, Belgium and other EU member states want to send troops to stabilize the situation and to strengthen the U.N. Peacekeeping force MONUC. United Nations news focus on the situation in the Democratic Republic of Congo.